What Are You Doing in September? Photo via Hero Round Table. I don’t go to a lot of conferences. Of those I’ve attended, very few are what I would describe as life changing. In fact, I can only name two that had a major influence on me. One of them, the Hero Round Table, is happening again this September. Last year was the Hero Round Table’s first year and I really didn’t know what to expect. It’s a conference on heroism, and specifically how to create heroism in today’s world. I was impressed not only by the high caliber of names on the speaker list (which made me a little nervous, since I was also on that list) but by the diversity of disciplines they represented: from psychologists and sports players to writers and public school teachers. None of them claimed to be heroes, but each one had learned something about heroism from seeing it up close. Arriving in Flint, I was immediately struck by the lengths the Round Table went to to make sure attendees would have a blast. That’s no accident: organizer Matt Langdon is a veteran speaker himself, and has a veritable encyclopedia of conference horror stories to tell. He insisted on getting things right, from the venue to the perks for ticket holders to the mid-conference entertainment. Most importantly, he made sure the whole event, as sweeping as it was, focused like a laser on one issue: how people can take these lessons home and create change wherever they go. In my opinion, it worked. I’ve never seen such a large crowd of people so engaged in heroism. People didn’t come there only to learn or hear cool stories, they came to understand what makes it possible for regular, everyday people to be heroic and then put it into action. I talked to everyone from a 17 year old figuring out her life to teachers fighting to reform our education system. In other words I think every attendee was trying to make a change either in the world or in themselves. You’ve heard of Edward Snowden? Snowden can’t return to US soil, but his friend and fellow whistleblower Daniel Ellsberg will speak about the bravery and risk involved in stepping forward when someone’s doing something wrong—even if it’s your own government. Edith Eger is one of the few remaining Auschwitz survivors. She speaks of “turning broken bones into dancing” and asks why some people become mired in adversity while others move past it. For her, forgiveness and letting go are the answer. All world leaders need security, including the Dalai Lama. For years, Stephen K. Hayes served as His Holiness’ personal bodyguard, blending a variety of martial arts with authentic ninja training to keep the Lama safe. That’s just a small part of a truly impressive lineup. The best part is that these speakers don’t just swoop in and swoop out—most of them will be hanging around the conference all weekend and, if last year is any indicator, happy to talk with anyone who comes up to them. To me, those conversations are the best part. 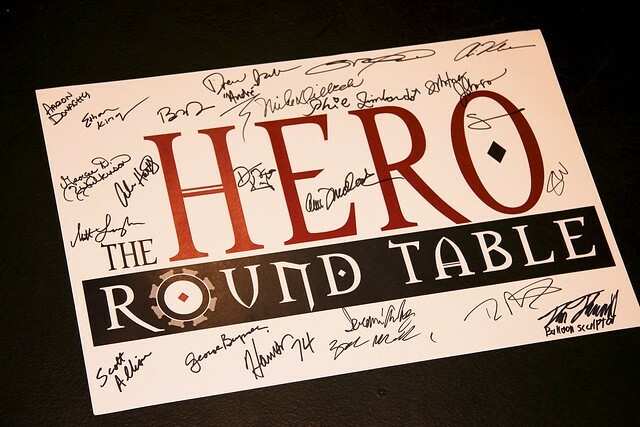 The Hero Round Table is happening in Flint, Michigan on September 19th and 20th, 2014. You can get more information and buy your ticket here. Tickets are going fast. As always, I don’t run paid promotions on this blog. I just believe in what the Hero Round Table is doing. It was a great experience for me and, if you like what I write on this blog, it probably will be for you to. I hope you get a chance to go. → Do You Doubt Your Journey Sometimes? ← Does Outdoors Time Improve Priests? Yeah…that one would be even more difficult…let know if it’s ever near the East coast or Mid-Atlantic region. For the US I think he’s committed to Flint, MI long term. I would love to see one in New Orleans, as I think the community here would appreciate it, but I suspect it’ll be one per country in the foreseeable future.